An important part of this walking tour is for the voices and narratives of women in art to be heard. For the tour to be successful and for the voices of women to resonate loudly it is important for the participants to be mostly women. The tour also attempts to grapple with issues of intersectionality; as such women of colour and trans women's voices should be respected and amplified within discussion. Finally, as the tour attempts to create discussion amongst females about feminism and gendered hierarchies within society, respect for fellow participants is of the highest priority. 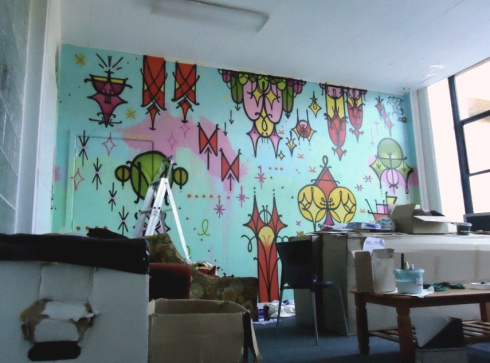 The mural featured in the Wom*n's room of Union House, University of Melbourne, was completed by female street artist Snortrag in 2012. She was chosen to complete the mural as female artists are often underrepresented, or their credibility is undermined within art discourse. A question to consider throughout the tour and open for discussion is whether affirmative action is required to inject women into the art world, or whether this kind of action is tokenistic? Secondly this tour attempts to reflect upon the ways women are perceived in space. Women have traditionally been associated with a private realm. This is born out of patriarchal values that women are emotional and vulnerable, thereby unfit for the social sphere. While conversely men, by virtue of their rationality, are better suited to the public aspects of social life. These ideas are obviously limiting to a woman's potential in the social world. A question for discussion at this stop is do the participants feel as though they have been limited by gender in regards to places they are/are not welcome in society. “University of Melbourne Wom*n's Room,” Street Art deTours, accessed April 20, 2019, http://streetartdetours.com/document/920.